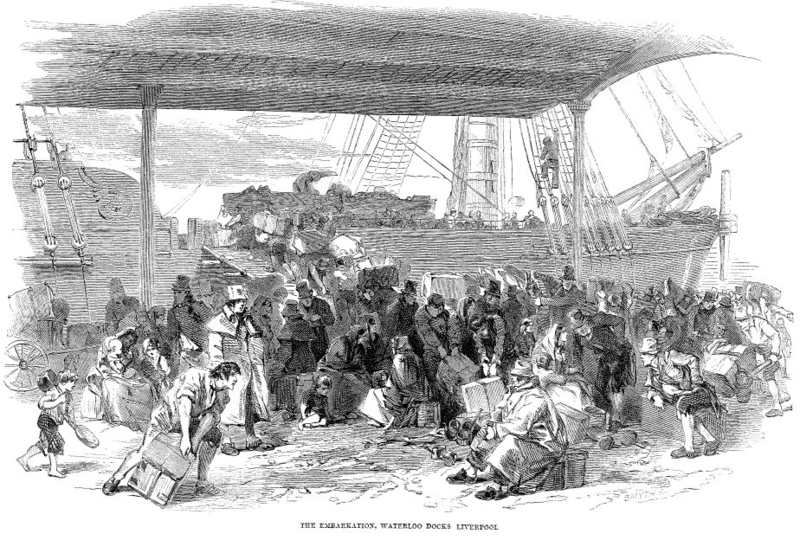 While the exact year and point of emigration are not yet known for William Ellis, it is likely he witnessed a scene much like the one depicted in The Embarkation (The London Illustrated, 6 July 1850, public domain). A son of John and Mary Ann Ellis, William Ellis was born in Ireland in 1829 in the town of Mayfield, which is now part of the north side of Cork city in the province of Munster in Ireland’s South-West Region. The opening decades of the nineteenth century saw a marked decline in the economic fortunes of Cork city. The ending of the Napoleonic Wars after 1815 was a major factor in the economic slump that affected the city. Prices for agricultural produce declined by one-third to one-half of the wartime prices. Cork Harbour no longer regularly hosted fleets of the Royal Navy and this caused a major decline in the provisions trade. The return of the currency to the gold standard led to a contraction of credit and the subsequent collapse of many banks…. The combined impact of these developments was catastrophic for the textile industry and the provisions trade. Unemployment in Cork rose to very high levels. By the winter of 1845/46 it was clear that more than half of the crop was unusable and widespread hardship was felt among the rural and urban poor. The Cork Relief Committee was set up in March 1846 and with government support organised [sic] the distribution of maize, known as Indian meal, to the poor and started schemes of public works to enable those employed to earn enough to buy food from the food depots. The maize was not given to the poor; it had to be paid for. The wages on the public works schemes were very low. Special constables were organised [sic] to expel vagrants from the city. The workhouse and the city hospitals were full. Starving beggars died on the streets. The cemeteries in the city couldn’t cope with the numbers to be buried and a new cemetery was opened at Carr’s Hill outside the city. Often, the mass graves contained so many coffins that those interred near the tops of the graves were insufficiently covered with earth allowing the foetid odour of decaying corpses to escape. Even the carts transporting the coffins to Carr’s Hill gave off such an odour that it was proposed to carry the corpses to the cemetery using large balloons. In the inner city and in the warren of lanes off Barrack Street and Shandon Street, the housing conditions were abysmal and overcrowded. Sanitation was primitive. Access to clean drinking water was limited. The streets and lanes were filthy, with human waste found along the gutters. In the houses of the very poor it was not uncommon to find manure which was collected for sale to farmers. In such conditions disease-causing micro-organisms flourished. During the Famine, the increase in overcrowding and the compromised immune systems of the poor led to a staggering increase in the incidence of disease…. Hospitals, filled beyond capacity, were forced to turn contagious patients away, who then in turn spread disease and death to even more locals. All of this was followed in 1848 by another failed potato harvest in Ireland and another cholera epidemic across Europe that same year. So, it comes as no surprise that, at some point during the mid-1800s, William Ellis headed for America in search of a better future. Allentown, Pennsylvania (c. 1865, public domain). Their wedding was held at the German Reformed Church in North Whitehall Township, Lehigh County on 15 November 1853. On 2 September 1855, William and Paulina Ellis welcomed daughter Sarah Matilda to their Lehigh County home. A second daughter, Susanna Isabella, was born in Catasauqua, Lehigh County on 15 February 1857, and son Peter arrived sometime around 1859. By 1860, William Ellis was employed a day laborer, and documented in the federal census as residing in Allentown’s First Ward with his wife and their three children. Ultimately, their little boy did not survive, a fact confirmed by legal paperwork filed by Pauline Ellis which stated that she was the mother of only two children in 1864 – daughters Sarah Matilda and Susanna Isabella Ellis. Before the first year of the new decade was over, political tensions roiled the adopted homeland of William Ellis. That December, South Carolina seceded from the United States, and propelled the nation into war. Less than four months after the fall of Fort Sumter, William Ellis felt compelled to leave his wife and young children, and enlist for Civil War military service. Enrolling at Allentown on 5 August 1861, he officially mustered in for duty on 30 August at Camp Curtin in Harrisburg, Dauphin County as a Private with Company I of the 47th Regiment, Pennsylvania Volunteer Infantry. * Note: Company I was one of the first two companies from the Borough of Allentown to join the Pennsylvania Volunteers’ 47th Regiment and was also the largest of the regiment’s ten companies to muster in during the Summer and early Fall of 1861. Several of this company’s initial recruits had been early responders to President Abraham Lincoln’s mid-April call for 75,000 volunteers to defend the nation’s capital, but most were new recruits – encouraged to join by Coleman A. G. Keck, a 26-year-old Allentonian and master miller. Military records at this time described Private William Ellis as a 32-year-old laborer and resident of Allentown who was 5 feet, 8-1/2 inches tall with brown hair, gray eyes and a light complexion. 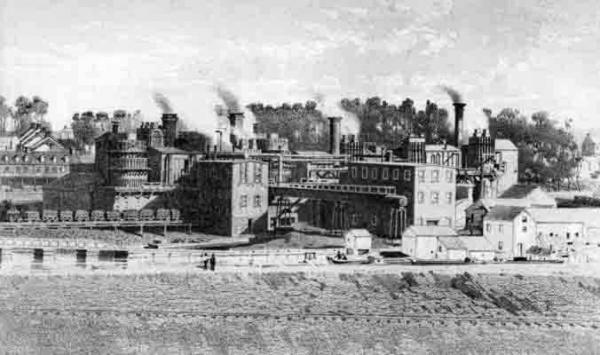 According to historian Lewis Schmidt, he was employed with the Allentown Iron Works prior to his enlistment. Col. Good, who has command of our regiment, is an excellent man and a splendid soldier. He is a man of very few words, and is continually attending to his duties and the wants of the Regiment…. Our Regiment will now be put to hard work; such as drilling and the usual business of camp life, and the boys expect and hope an occasional ‘pop’ at the enemy. 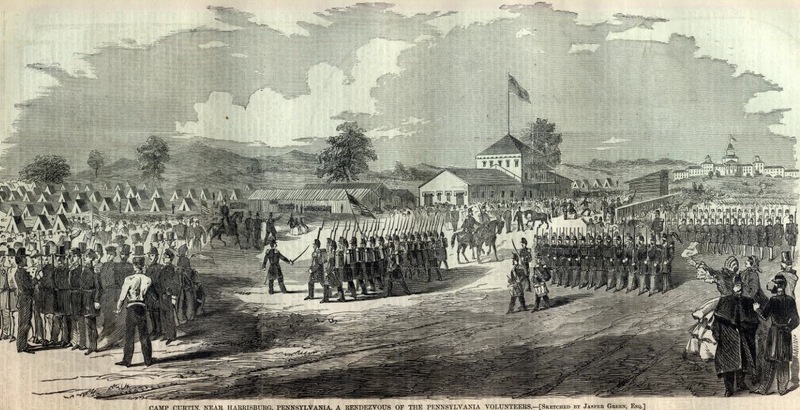 On 24 September, the soldiers of Company I became part of the federal service when the 47th Pennsylvania Volunteers officially mustered into the U.S. Army. Three days later, the 47th was assigned to Brigadier-General Isaac Stevens’ 3rd Brigade, which also included the 33rd, 49th and 79th New York regiments. By that afternoon, the 47th Pennsylvania was on the move again, marching with their Mississippi Rifles and behind their regimental band until reaching Camp Lyon, Maryland on the Potomac River’s eastern shore. At 5 p.m., they joined the 46th Pennsylvania in moving double-quick (165 steps per minute using 33-inch steps) across the “Chain Bridge” marked on federal maps, and continued on for roughly another mile before making camp. The next morning, they moved again. Marching toward Falls Church, Virginia, they arrived at Camp Advance around dusk. There, about two miles from the bridge they had crossed a day earlier and after a roughly eight-mile trek, they re-pitched their tents in a deep ravine near a new federal fort under construction (Fort Ethan Allen). Situated fairly close to General W.F. Smith’s headquarters, they were now part of the massive Army of the Potomac, and would help to defend the nation’s capital through late January. Sometime during this phase of duty, as part of the 3rd Brigade, the 47th Pennsylvania moved to “Camp Big Chestnut.” Named for the large chestnut tree located within the camp’s boundaries, the site would eventually become known to the Keystone Staters as “Camp Griffin,” and was located roughly 10 miles from Washington, D.C.
As a reward for their performance that day – and in preparation for the even bigger events which were yet to come, Brigadier-General John Milton Brannan ordered that brand new Springfield rifles be obtained for every member of the 47th Pennsylvania Volunteers. But these frequent marches and their guard duties in rainy weather gradually began to wear the men down. A number of soldiers fell ill with fever and other ailments; several died. Next ordered to move from Virginia back to Maryland, Private William Ellis and his regiment left Camp Griffin at 8:30 a.m. on Wednesday, 22 January 1862. Marching through deep mud with their equipment for three miles, they reached the railroad station at Falls Church, where then were then sent on by train to Alexandria. Boarding the steamship City of Richmond, they sailed the Potomac to the Washington Arsenal, where they were reequipped and marched off for dinner and rest at the Soldiers’ Retreat in Washington, D.C. The next afternoon, the 47th Pennsylvanians hopped cars on the Baltimore & Ohio Railroad and headed for Annapolis, Maryland. Arriving around 10 p.m., they were assigned quarters in barracks at the Naval Academy. They then spent that Friday through Monday (24-27 January 1862) loading their equipment and other supplies onto the steamship Oriental. The regiment was formed and instructed by Lt. Col. Alexander ‘that we were about drumming out a member who had behaved himself unlike a soldier.’ …. The prisoner, Pvt. James C. Robinson of Company I, was a 36 year old miner from Allentown who had been ‘disgracefully discharged’ by order of the War Department. Pvt. Robinson was marched out with martial music playing and a guard of nine men, two men on each side and five behind him at charge bayonets. The music then struck up with ‘Robinson Crusoe’ as the procession was marched up and down in front of the regiment, and Pvt. Robinson was marched out of the yard. Reloading then resumed. By that afternoon, the enlisted men of the 47th Pennsylvania Volunteers commenced boarding the Oriental, ferried to the big steamship by smaller steamers. The officers boarded last. Per the directive of Brigadier-General Brannan, the Oriental steamed away for the Deep South at 4 p.m., and headed for Florida which, despite its secession from the Union, remained strategically important to the Union due to the presence of Forts Taylor and Jefferson in Key West and the Dry Tortugas. 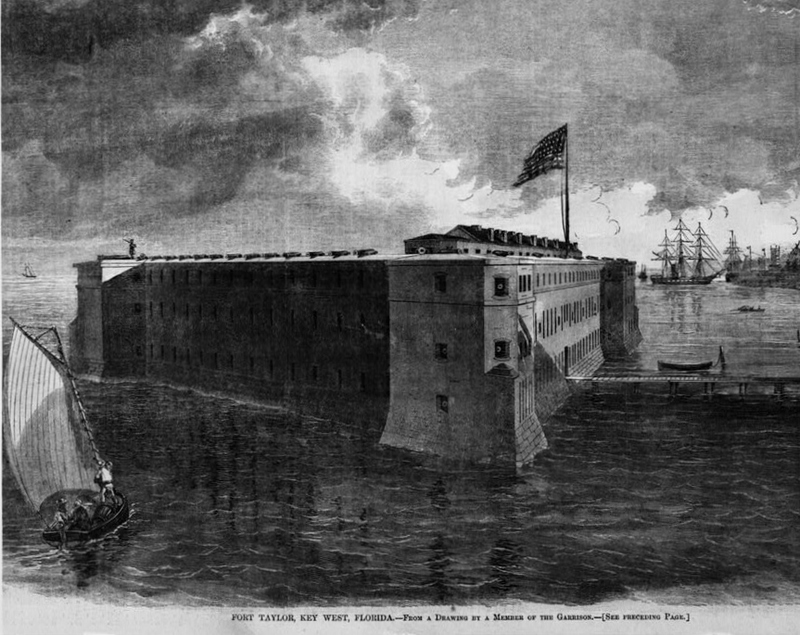 Upon arrival at Key West in early February 1862, Company I and the 47th Pennsylvania Volunteers were assigned to garrison Fort Taylor. They drilled daily in heavy artillery tactics, felled trees, helped to build new roads, and strengthened the fortifications in and around the federal installation. During the weekend of Friday, 14 February, the members of the regiment introduced their presence to Key West residents via a parade through the streets of Key West. That Sunday, Captain Keck ensured that his I Company men attended to their spiritual needs by having them attend services at a local church. On Saturday, 12 April 1862, regimental Order No. 4 directed Captain Coleman Keck and Private William Smith to head back to the Keystone State for recruiting duty. This assignment kept I Company’s commanding officer at home at least until 11 June 1862, according to military records. 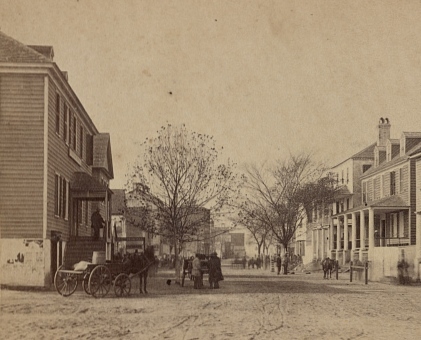 Bay Street Looking West, Beaufort, South Carolina, c. 1862 (Sam A. Cooley, 10th Army Corps, photographer, public domain). From mid-June through July, Private William Ellis and his fellow 47th Pennsylvanians were ordered to Hilton Head, South Carolina where they pitched their tents before being housed in the Department of the South’s Beaufort District. Picket duties north of their 3rd Brigade encampment were rotated among the regiments present, putting soldiers at increased risk from sniper fire. According to historian Samuel P. Bates, the men of the 47th “received the highest commendation from Generals Hunter and Brannan” for their “attention to duty, discipline and soldierly bearing” during this phase of service. Sometime around 26 July 1862, Private William Ellis fell ill with fever. Allowed to convalesce initially in I Company’s quarters, he was transferred to the U.S. Army’s General Hospital No. 3 at Beaufort the next day when it became clear that his condition was not improving. Death of Private William Ellis, Co. I, 47th Pennsylvania Volunteers, Beaufort, South Carolina, 1 August 1862 (Registers of Deaths of U.S. Volunteers, public domain). Excerpt of letter from Capt. 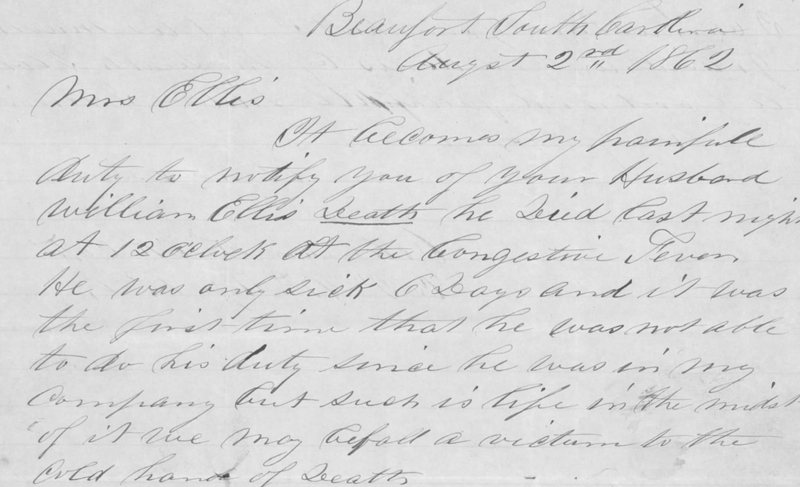 Coleman Keck, I Company commanding officer, 47th Pennsylvania Volunteers, to Paulina Ellis, notifying her of husband William’s death on 1 August 1862 (U.S. Civil War Pension Files, public domain). It becomes my painful duty to notify you of your Husband William Ellis’ death he died last night at 12 o’clock of the Congestive Fever. He was only sick 6 days and it was the first time that he was not able to do his duty since he was in my company but such is life in the midst of it we may befall a victim to the cold hand of death. I shall bury his remains tomorrow with military Honors He was put in the Genl Hospital the second day he was sick where he had all care taken of him. Nicholas McKeever nursed him like a brother as long as he was in my company quarters. I shall make his final statement next week and send you a copy of it as regards his pay and clothing he has 3 months pay due him. I hope you will be consoled as well as he is. We must think he is better taken care of than if he was living in this world of truth and sorrow. “Co. I” 47th Regt. P.V. … my husband went to war 1861 enlisted in camp and 47th regiment Pennsylvania volunteers died during war in Beauford [sic] S. Carolina of Cholera Glorbus or congestive fever on 1st of August 1862…. Private William Ellis, Burial, Beaufort, South Carolina, August 1862 (U.S. Army Burial Ledger, public domain). * Note: Although there is a memorial for Private William Ellis on Find A Grave, which states that he was buried at the Beaufort National Cemetery, his remains were exhumed and returned home. After a short burial in South Carolina, his body was returned from Beaufort by Allentown undertaker Paul Balliet and the transport Delaware on November 29. His family was one of the few who spent the government’s $100 as intended, to bring home the body of the deceased soldier, whose remains in this case are now buried in the Fairview Cemetery at West Catasauqua. 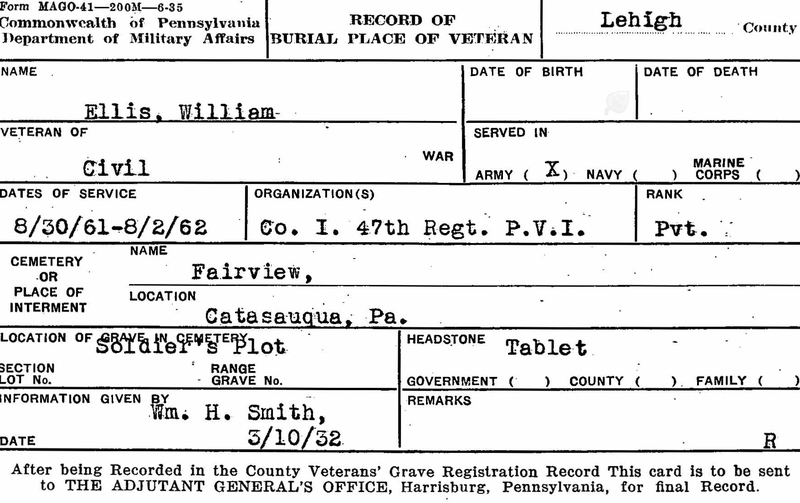 Pennsylvania Veterans’ Burial Index Card for Private William Ellis, 47th Pennsylvania Volunteers (Pennsylvania Historical and Museum Commission, public domain). His memorial at the Fairview Cemetery in West Catasauqua, Lehigh County may be found here. Paulina Ellis was apparently able to support her children from the combined resources she had built with her husband during their nine year marriage and via the aforementioned military pay that was due him – at least initially. After remarrying in late 1863, she then sought and received U.S. Civil War Orphans’ Pension support for her two daughters by her first husband, Private William Ellis. 2. Ellis, William, in Civil War Veterans’ Card File, 1861-1865. Harrisburg: Pennsylvania State Archives. 3. Ellis, William and Paulina Halbeck, in Record and Indexes of Births, Deaths, and Marriages (Microfilm Rolls 668-673), in Records of the Department of State (Record Group 26, Secretary of the Commonwealth, Series 26.28). Harrisburg: Pennsylvania State Archives, Harrisburg. 4. Ellis, William, Paulina Ellis Rummeler, Sarah Matilda Ellis, and Susanna Isabella Ellis, in U.S. Civil War Widows’ and Orphans’ Pension Files. Washington, D.C.: U.S. National Archives and Records Administration, 1862-1912. 5. Baptismal, Marriage and Death Records of the Ellis and Drum/Rummeler Families (St. Paul’s Lutheran Church, Allentown, etc. ), in Historic Pennsylvania Church and Town Records. Philadelphia: Historical Society of Pennsylvania. 6. 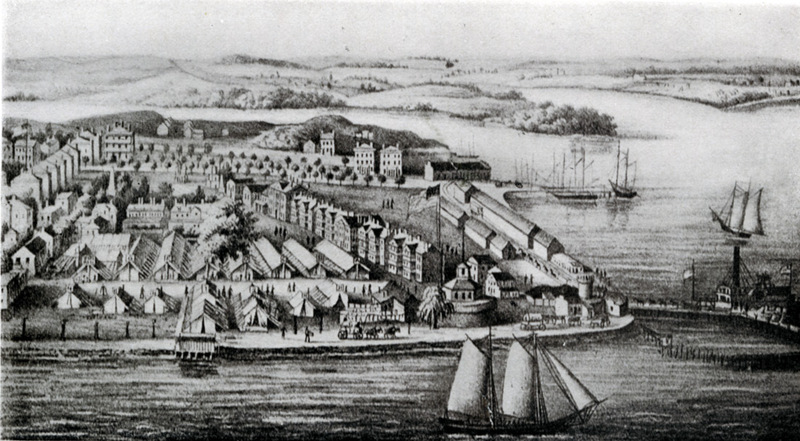 Cork in the 19th Century, on Cork Past and Present. Cork, Ireland: City Council | Comhairle Cathrach Chorcai, retrieved online 2 March 2016. 7. Pennsylvania Veterans’ Burial Index Cards. Harrisburg: Pennsylvania Department of Military and Veterans Affairs. 8. Registers of Deaths of Volunteers, in Records of the U.S. Adjutant General’s Office. Washington, D.C.: U.S. National Archives and Records Administration, 1861-1865. 9. Schmidt, Lewis. A Civil War History of the 47th Regiment of Pennsylvania Veteran Volunteers. Allentown: Self-published, 1986. 10. The Embarkation, Waterloo Docks Liverpool, in The London Illustrated News. London: 6 July 1850. 11. U.S. Census. Washington, D.C. and Pennsylvania: 1860.